Do you have a story about accommodation in Tenerife? Have you stayed in a really good hotel - or a really bad one? Why not tell us all about it? Click here. 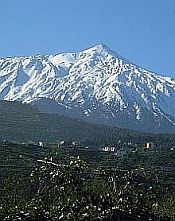 Tenerife relies on the tourist trade for its economy, so the island is absolutely chock-a-block with all manner of hotels, self-catering apartments, villas (both standard and luxury) and basic hostels (or "pensions"). On this page, I'll try to deal with each in turn. Do you think Las Americas has enough holiday accommodation? For those of you just visiting Tenerife on holiday, not wanting self-catering, there is the option of hotel accommodation. There are, of course, hundreds of these all over the island, ranging from economy to full five-star. Find A Great Hotel Deal Here! For my part, I'll just try and give you some idea of the more prestigious ones. Situated in Puerto de la Cruz, this five-star hotel is one of the best, if not the best in Tenerife. Built rising from the beachfront at Adeje, this resort village is the jewel in the crown of the south coast. Situated at the north end of Las Americas, this luxury hotel is modelled on Mexican and Mayan architecture. Luxury 5-star accommodation right on the seafront, between Los Cristianos and Las Americas. Five-star luxury, situated in Costa Adeje, with direct access to Playa Fañabe. Quite a mouthful for a name, but this luxury hotel complex is tucked away from the main tourist areas on the coast in the small village of Alcala, on the south-west coast. Found right at the eastern end of Los Cristianos, this luxury hotel is a short taxi ride or a brisk walk from the centre of Las Americas. These apartment complexes probably outnumber the hotels in the main tourist areas! They usually come equipped with a fully-fitted kitchen and you'll probably find a supermarket not too far away (some make free deliveries). So, if you cook all your own meals, this is definitely a more economical option. There are so many, I'll just give you a few examples as a sampler. They are ones I've stayed in, so I can vouch for them. 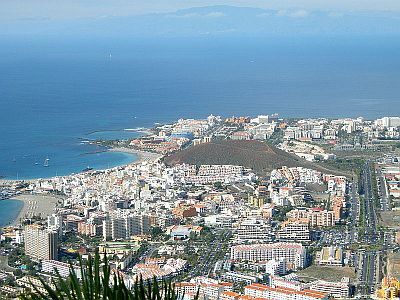 Situated at the far end of Los Cristianos, this complex is typical of the many that can be found liberally scattered about the island. Many of the apartments available for rent are privately owned and are, as a result, very well maintained. The poolside bar is a family owned business, the family in question being English and friends of mine. The complex boasts a laundry and an office, dealing with rentals, such services as sending/receiving faxes and emails and selling small holiday items such as postcards and second-hand books. As complexes go, I'd say it was well above average. Another, similar complex in the same area of Los Cristianos, but situated a bit further back from the main road. It, too, has a British-run bar/restaurant. The apartments are nice, with all the facilities and there is a British-run office on the premises that can help you with such things as excursions. This is not far from Victoria Court I (as you'd expect) and is where the apartment of my other half, Alison, is found. It has a British-run bar/restaurant, serving meals, drinks and snacks throughout the day. There's a British-run office that can help you with any information you require, plus Internet access and a handyman standing by in case the apartment needs any routine maintainance. If you want an idea of what these apartments look like inside, then check out this page. If you like what you see, why not make a booking! I've had stints staying in apartments both on Amarilla Golf (Fairways) and Golf del Sur (Green Park), both fine examples of accommodation. The only drawback with these two urbanisations is that they're a bit isolated. To get out to any of the major resorts or to visit attractions, you need a hire car or taxi. Within their areas, though, there are plenty of bars, restaurants and entertainment. If you're a backpacker or when money's a bit of an issue, you could do worse than book into a hostel, or pension. These are very basic accommodation blocks, containing small rooms with, sometimes, just a bed and a sink. The beauty of them is that you get a roof over your head for very little money. One I stayed in a few times was La Estrella (the star), situated on the road into Las Galletas. Back then, the place was run by a teutonic gentleman who wondered around in his braces (plus the rest of his clothes, of course). For all I know, he's still there now. La Estrella, like most pensions, has shower rooms situated on each floor, so you grab your towel, shampoo and soap and off you go! Down on the ground floor, there was a typical Canarian tapas bar/restaurant, serving, as usual, excellent food quite cheaply. Subsequently, the restaurant was taken over by a Chinese family, so La Estrella became a place of cheap accommodation, with a Chinese restaurant for good measure. These economy accommodations are scattered liberally throughout the island. As pensions go, La Estrella is one of the better ones. Tenerife has its fair share of villas and they can range from reasonably basic, through to the ultimate in luxury. On average sleeping six people, they are ideal for large families or groups of friends. I've a seperate page for villas here. Have A Great Story About Tenerife Accommodation? Have you stayed in any of the hotels featured on this page? Are these top hotels are as good as they make out? Do you have any good experiences with accommodation in Tenerife - or any really bad ones? Then tell us all about it! Parque tropical phase 2 Los Cristianos. Puerto Santiago, a 4th floor, 3 bed, en suite bathroom, shower room, the best of all was a 40mt balcony with the best view of Los Gigantes cliffs.